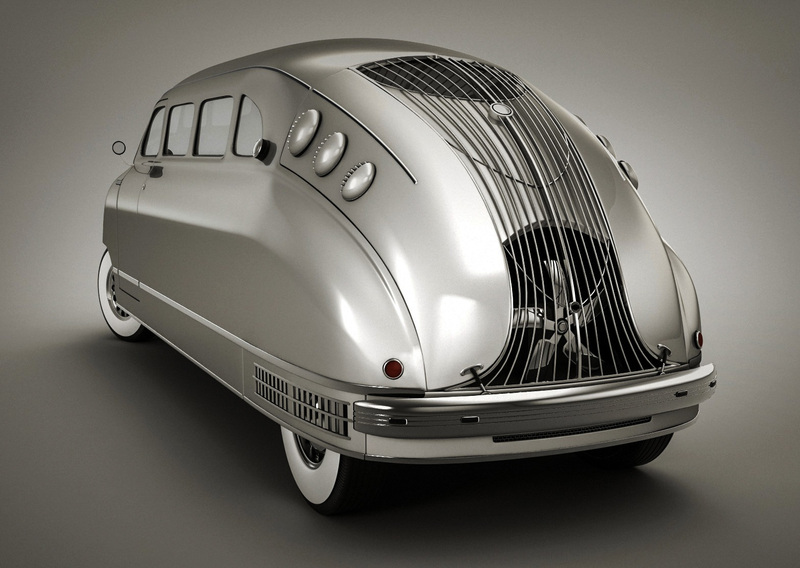 1 of 17 Strange Car Design (High Museum of Art) – Bin3aiah World! 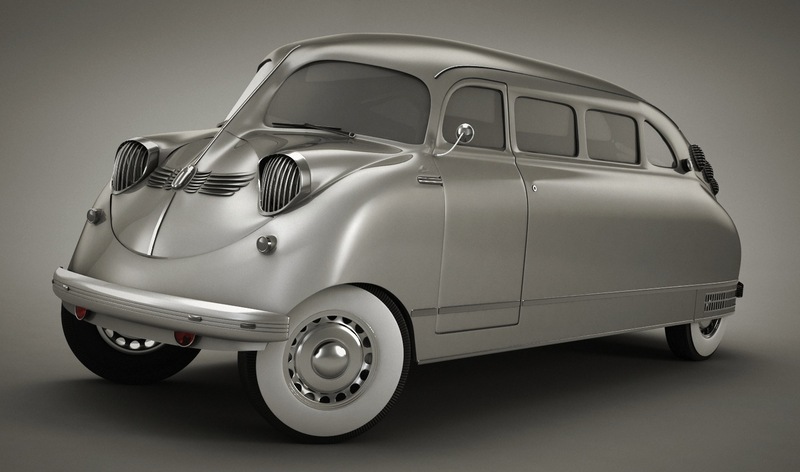 The history of automotive design is littered with bold attempts to create vehicles so different in how they look and how they work that they render obsolete everything that?s come before. The most daring of these are usually concept cars, which are not limited by practicality or government regulations and can therefore allow automakers to really push the limits. For its latest exhibit, the High Museum of Art in Atlanta has assembled 17 of the most beautiful, hideous, and strange automotive concepts ever dreamed up by man, from a 1934 Bugatti prototype up to an early iteration of the Porsche 918 Hybrid super car. What happens when creators balance aesthetics, functionality, and their personal vision of the future is one reason we love cars. That?s especially true when the results leave us wondering, How could anyone think this was a good idea? 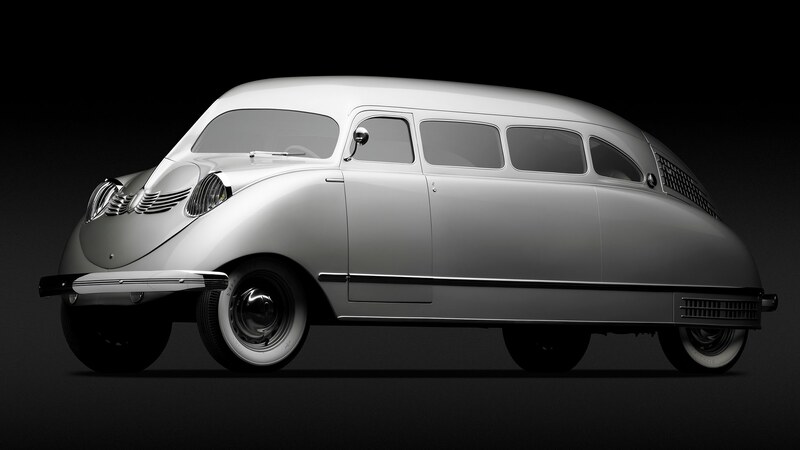 The Stout Scarab is a 1930-1940’sÂ AmericanÂ minivan. 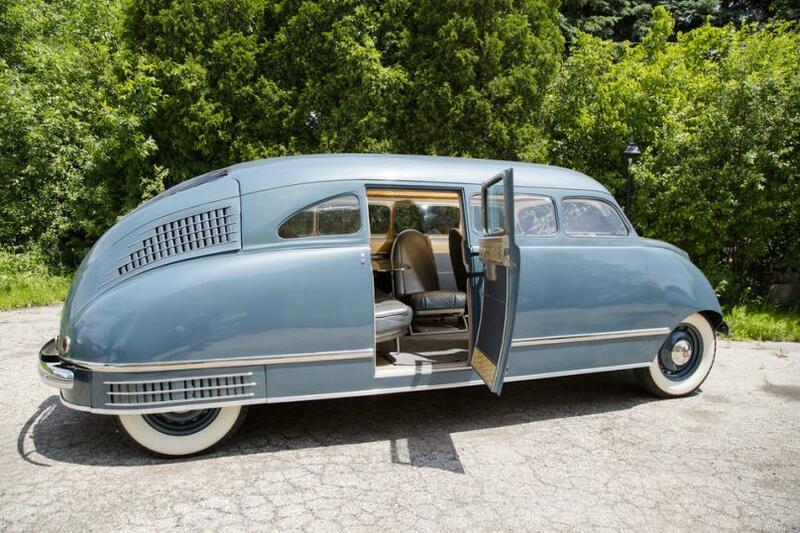 It was designed by William Bushnell StoutÂ and manufactured by Stout Engineering Laboratories and later by Stout Motor Car Company ofÂ Detroit,Â Michigan. 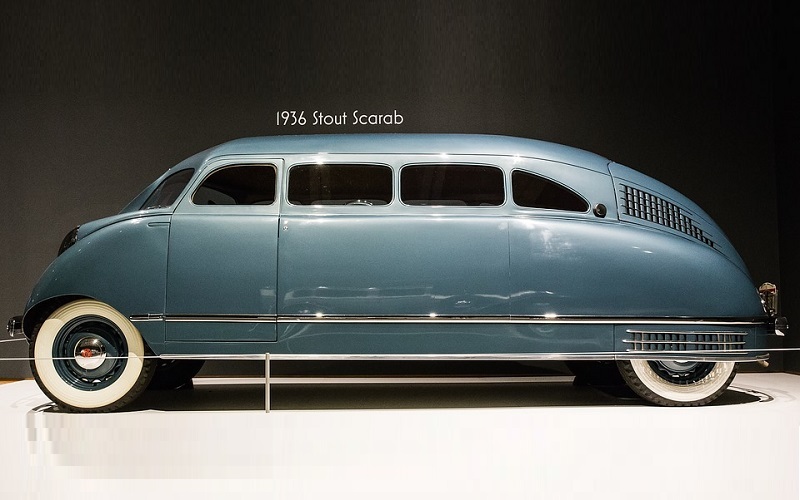 The Stout Scarab is credited by some as the world’s first production minivan, and a 1946 experimentalÂ prototype of the Scarab became the world’s first car with aÂ fiberglass body-shell andÂ air suspension. 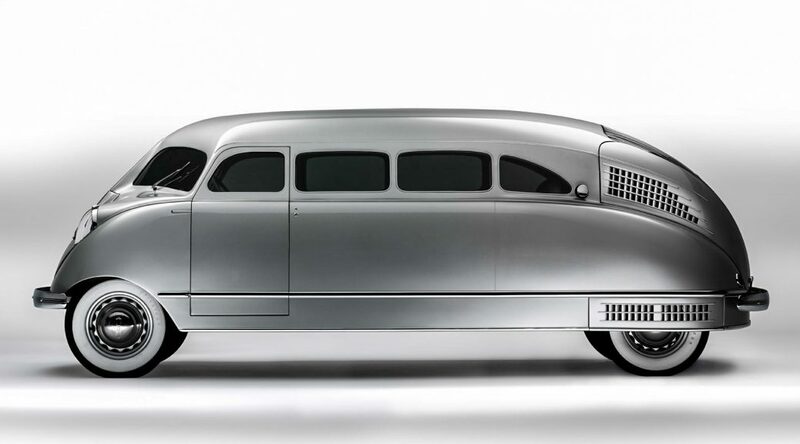 Designer William Stout, who worked as an aircraft engineer before turning to automobiles, was a pioneer in integrating luxury and leisure into transportation. Stout Air Lines is credited with introducing flight attendants and in-flight meals. 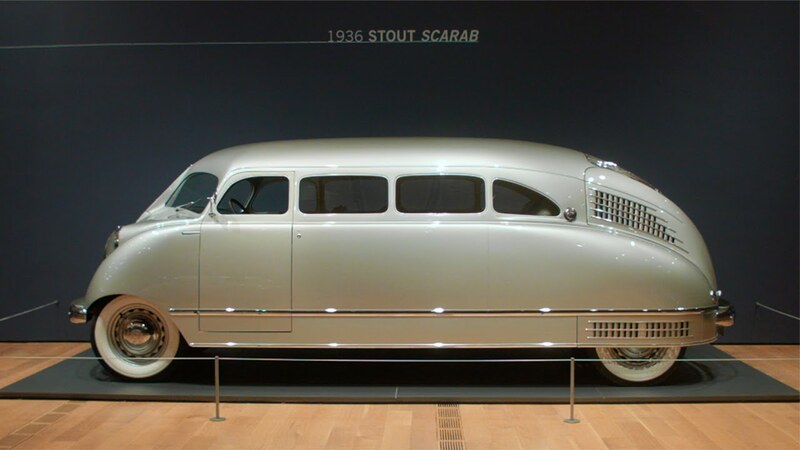 The Scarab draws on that idea; it’s a road-going diner car powered by a Ford V-8 tucked in the rear of the stretched aluminum body. 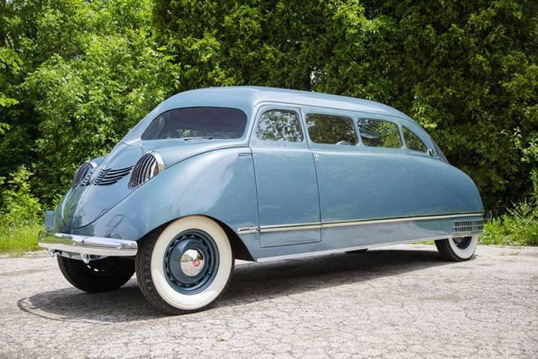 The brand never took off, partly because at $5,000 (about $90,000 today), the Scarab was more expensive than the Packard’s and Cadillac’s of those days. Fewer than ten were produced. My spouse and i were now fulfilled Raymond could do his preliminary research via the precious recommendations he had from your very own weblog. It is now and again perplexing to just happen to be freely giving key points some people may have been trying to sell. And we do know we now have the website owner to thank because of that. The explanations you’ve made, the simple blog menu, the friendships you will make it possible to promote – it’s all wonderful, and it is aiding our son in addition to our family consider that the article is awesome, which is certainly particularly essential. Many thanks for the whole lot! blog; this website includes awesome and in fact excellent data in support of visitors. I definitely wanted to construct a quick note to express gratitude to you for all of the fabulous items you are sharing at this website. My considerable internet search has at the end of the day been rewarded with reputable details to share with my guests. I ‘d admit that most of us readers actually are undoubtedly blessed to be in a fabulous site with so many marvellous individuals with useful principles. I feel very blessed to have discovered the site and look forward to really more amazing times reading here. Thanks a lot once again for a lot of things. Aw, this was a very nice post. In thought I wish to put in writing like this moreover ?taking time and precise effort to make an excellent article?but what can I say?I procrastinate alot and certainly not appear to get something done. A lot of thanks for your entire work on this web page. Ellie take interest in engaging in research and it’s really easy to see why. All of us learn all about the compelling manner you offer very important items through this blog and as well increase participation from people on the subject matter so my princess is without question discovering so much. Have fun with the remaining portion of the year. You are always carrying out a first class job. I and my pals ended up digesting the nice tactics located on your website and so quickly came up with a terrible feeling I had not thanked the website owner for those secrets. All the people happened to be as a result joyful to read all of them and have now undoubtedly been loving these things. We appreciate you truly being really kind and then for pick out varieties of quality subject matter millions of individuals are really needing to know about. My very own honest apologies for not saying thanks to sooner. I not to mention my friends came following the nice tactics from your website and so instantly I got a horrible suspicion I had not thanked the web site owner for those strategies. The people became as a consequence warmed to read all of them and have now absolutely been tapping into those things. Thank you for being simply considerate and also for utilizing variety of impressive issues millions of individuals are really eager to understand about. My personal honest apologies for not expressing appreciation to you sooner. My spouse and i felt very peaceful that Chris could conclude his preliminary research because of the precious recommendations he got from your own web page. It’s not at all simplistic to just continually be offering tips most people might have been making money from. And we fully grasp we need the blog owner to give thanks to for that. The entire explanations you’ve made, the simple web site navigation, the relationships you will aid to engender – it’s got everything spectacular, and it’s really leading our son in addition to us do think this theme is exciting, and that’s wonderfully fundamental. Thanks for the whole lot! My husband and i got now ecstatic when Peter managed to finish off his reports through the precious recommendations he discovered in your site. It is now and again perplexing just to always be offering ideas that a number of people may have been selling. So we fully grasp we need the blog owner to thank for this. The most important illustrations you have made, the straightforward website navigation, the friendships you will make it possible to promote – it’s got mostly great, and it’s really making our son in addition to us believe that that theme is pleasurable, which is tremendously pressing. Many thanks for the whole thing! I wish to express my passion for your kindness in support of people who really want assistance with the area. Your real commitment to passing the solution all over had become rather helpful and has usually encouraged individuals much like me to arrive at their goals. Your own insightful tips and hints entails a great deal a person like me and still more to my fellow workers. Best wishes; from each one of us.